This recipe is for 1 Seatrout. Multiply ingredients for each additional Seatrout. 1 Speckled Sea Trout or Weakfish, scales, gutted, de-headed and cold water rinsed. Place foil on baking sheet. 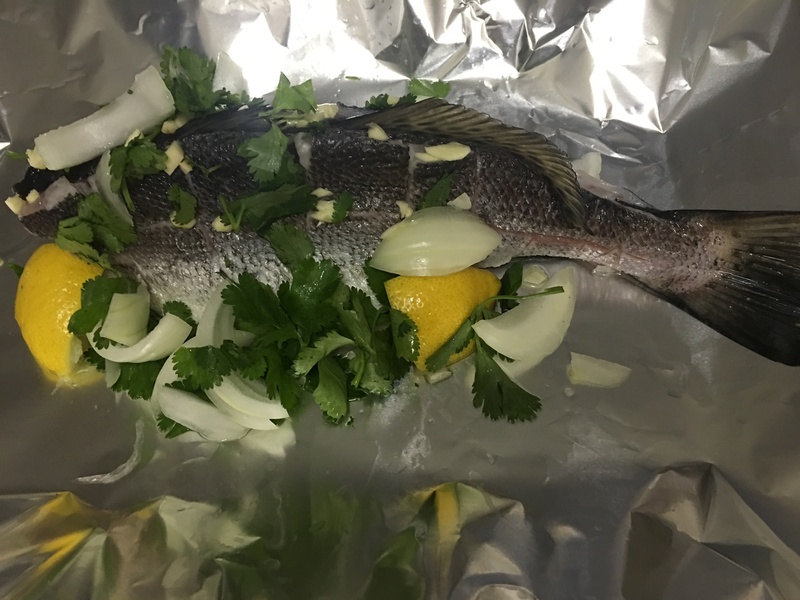 Place fish on top of foil. Squeeze the lemon juice from 4 of the wedges over entire fish catching juice on foil. Lightly brush entire fish with butter. Sprinkle ½ the chopped garlic on both sides of the fish pressing some into the slices of the meat. With fish on its side, stuff the bottom cavity of the fish with the un-squeezed lemons, ½ the onions, ½ the garlic and ¾ of the cilantro. (Don’t worry if it all doesn’t fit in the cavity. Roll the stuffed fish where its sitting upright (belly down) keeping as much of the stuffing mixture in the cavity. Arrange the excess onions garlic and cilantro along with the squeezed lemons evenly on both sides of the fish. Sprinkle remainder of onions over fish. Sprinkle remainder of cilantro over the fish. (You can push some into slices). Drizzle 1 tbsp of butter over the very top along the length of the fish. Gather foil around the fish making sure the entire fish and ingredients are contained. Place on center rack of oven.